Need ideas for relay races for kids? Look no further. Here you will find an assortment of relay race activities and ideas to use for any event. 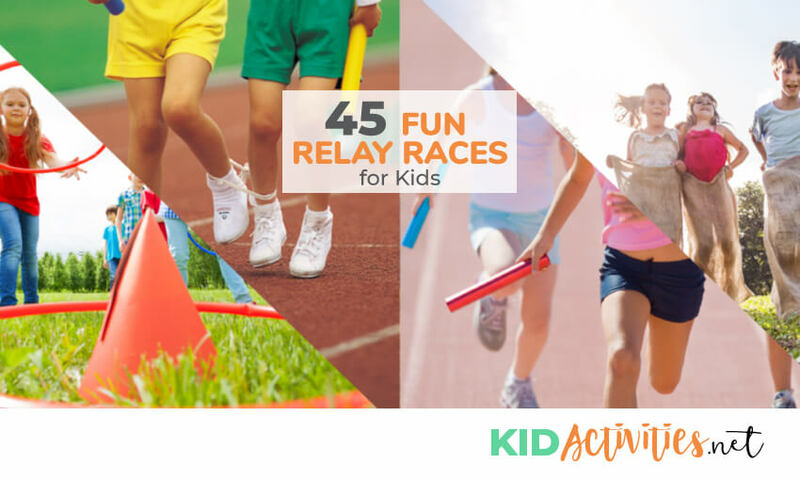 These relay activities are sure to keep kids of all ages having fun and even getting some physical exercise along the way. Relay races are a great way to teach kids how to be part of a team as well as learning social skills. THE FOLLOWING GAMES ARE GREAT FOR BOTH INDOOR AND OUTDOOR PLAY–as well as parties, themes and Red, White and Blue Days! Below are relay and races as well as games that use bean bags, eggs, and balloons! Two newspaper sheets required per player. Each player must race to the turning point and back, stepping only on his newspapers. He steps on one, lays the other in front of him steps on it, moves the first forward, and steps on it and so on. Players run to turning point, stop, lie down on their backs, fold hands across chest and get up without moving their arms, and run back to finish line. 1. Have kids get into pretzel positions by standing on their left leg. 2. Lift the right leg and cross it in front of the left knee. 3. Cross arms in front of the body. 4. On the word “go” hop to the finish line. The “pretzel” who gets to the finish line 1st wins. Children stand in partners in a double circle. The partners skip around the circle. On signal, the inside person stops, folds their arms and puts their legs apart. The outside person runs around the circle, goes through partner’s tunnel and sits cross-legged on the inside of the circle. Lay a broom across two chairs for each team. Form teams and direct them to run from the starting line to the broom, crawl under the broom without knocking it off, and then run back to the starting line where they tag the next guest in line. Continue until each guest has had a turn. Team formation, Players #1 stand facing the goal. Player #2 stands beside him, with his back to the goal. The two players link elbows and on the signal, the pair run to the goal and back. One person runs backward each time. The rest of the players repeat the same action until every person has a turn. Need several balls and a bat, broom, or yardstick for each team. Put teams in separate lines (rows). First child takes the ball and pushes or bats (whatever you decide) the ball from one end of the room to the other. They then pick up the ball with one hand and drag the broom or stick with the other… and run back to starting line. It can be varied by the kids going backwards while pushing or batting the ball to their teams or the players hopping while going back and forth. Divide the group into teams of 8-10 players and give each team a banana. 1. Place the banana between the knees and hop down the course and back. 2. Two teammates tossing the banana back and forth down the course and back. 3. The banana under your armpit and hopping on one leg down and back. 4. Teammates line up in leapfrog formation and first player hops over players while holding banana and then tosses banana to next player in line to do the same. Show the players all the relays that they’ll have to complete for the Olympics. You may have to write them on a large white board so that all players will know what relay is next. Once a team has completed all these relays someone (or the whole team) on the team must eat the banana and the team that is done first is the winner. Use your own ideas, add to the list or use only a few ideas. You can adjust this game to all types of players including the disabled. 2. Partners are placed in file formation. 3. Place cones at the end of the play area. 4. The first two partners have a soccer ball. 5. On signal, they must run, PASSING THE BALL FROM ONE TO THE OTHER… up to.. and around… the cone. 6. They return passing the ball the same way ..and give the ball to the next two in their team. 7. Relay play continues in same manner. 2. The first player runs up and picks up a hoop. 3. The other team members run up and go through the hoop. 4. When all are through, the leader with the hoop rushes back with the hoop. 5. The leader hands the hoop to the second person who runs up and everyone runs through again. 6. Give everyone the chance to be the leader. Have the children bring two shoe boxes with them. Tape the lids onto the boxes, then cut a one-inch-wide and four-inch long slit in each top. The race can be individual–with all youth racing together in a horizontal line–or done as a relay. 1. Create groups of four or five players in file formation. 2. The teams stand behind a line. 3. TWO PLAYERS FROM EACH TEAM ARE DESIGNATED AS OBSTACLES: one to go under and one to jump over. 4. On signal, the first person in each team runs up and crawls UNDER the first obstacle; This person obstacle does a push up holding the position. 5. The player then jumps OVER the second obstacle and then touches the given line. This player then runs back to tag the next team member to do the same. 1. Put a handful of cotton balls in one of the bowls. Put the other empty bowl on the opposite end of the mat. 2. Rub Vaseline on the child’s nose and have them put their nose in the bowl with the cotton balls. 3. The object of the game is to get as many cotton balls as possible on their nose without using their hands. 4. 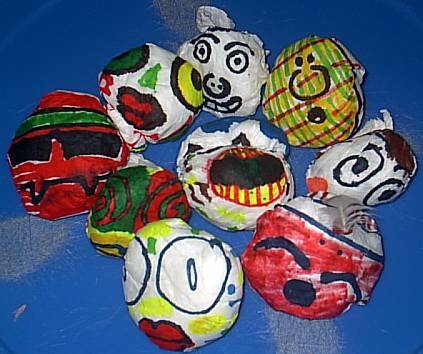 After cotton balls are stuck to their nose—they crawl over to the empty bowl — and take them off their nose with their hands– kids then put them in the bowl. Wipe the Vaseline off with a tissue or napkin. 5. If you play with TEAMS set a time limit, and see who moves the most cotton balls from one bowl to the next. Players run the course from the head of the team to the turning point and back to the head of the team. They follow the course as to whatever you have set-up. The use of hoops, skipping ropes, Indian clubs, mats, low vaulting boxes, basketball hoops, or what-have-you offer an almost endless selection of obstacles. • Split youth into two teams. • Give each team a cup of popcorn. • Have each player take turns walking with the cup of popcorn on their heads, across the room, around a chair and back to their team. • Play for a specified amount of time such as 2 minutes or more. The team that has the most popcorn left in their cup wins! In stunt relays, the runners advance to the turning point— stops and performs a stunt (that has been pre-determined). They return to tag the next runner on their team. There is virtually no end to the number of stunts which can be performed. Cut rags in wide strips ~ 3 feet long. 27. THE 100 INCH DASH! Give each child a small paper bag. With the signal, race to the marker and then blow up the bags. Instruct youth to pop them with their hands and then race back to the line. The first player to pop his/her bag and return to the finish line is the winner. Tape down or mark a starting and finish line. The first child who reaches the finish line-without loosing the straw is the winner. Adjust the running distance to the age of the child. 5. This carries on until all the players have jumped. This can be played with one line or in Teams. TRACK RACE: Each player lines up at the start line and race by placing the heel of one foot against the toe of the next. The first one to the end of the track and back wins. HIGH JUMP: Each contestant takes a deep breath and whistles. The contestant who holds the note the longest wins. HIGH DIVE: Each player stands on a chair (or faces the chair back-rest and then kneels chair seat) with ten clothes pins and drops them into an empty bottle. The player that gets the most wins wins the olympics. As quickly as possible, walk backwards to the finish line. While doing this—try not to bump into each other. Put up a chart with the below challenges…who can complete the list???? •Throw a beanbag in the air, turn around, and catch it again. •Throw the beanbag up and backwards over your head and try to catch it behind your back. •Throw the beanbag in the air, clap your hands once, and catch it. Now try clapping your hands twice, then three times, and so on. How high can you go? •Throw the beanbag in the air and clap your hands under your right leg before catching it. Now try with your left leg. Now clap behind your back. Invent some more challenges. •Throw the beanbag up, jump, and try to catch it. Jump twice. Jump three times! •Throw it up, kneel down and try to catch it. •Throw and catch with just your right hand, then with just your left. •Try throwing it up and catching it with your eyes closed! •Balance the beanbag on your right foot, then throw it up and catch it from there. Can you do it with your left foot too? •Can you throw the beanbag up and catch it on your left foot? •Can you run with a beanbag balanced on your head? Can you jump? Can you twist around? Can you kneel down and stand up again, or sit down? Can you climb the stairs? Can you do any of these things with two beanbags balanced on your head? Or three? •Try balancing a beanbag on each shoulder while you walk, run, jump etc. •Sing one of your favorite songs or rhymes while you throw the beanbag up and catch it, or pass it round a circle of children. 36. BEAN BAG RELAY GAMES Age: 4 and all the way up! How to play: The children pass the beanbag from one to the next and back again, in a particular style, which you can decide as appropriate for the age of the children. TIP: For younger children, it might be a good idea to practice the game movements first! If a beanbag is dropped, you can make the children start again from the the front of the row. TIP: Cue the kids! On a white board or chart paper write the order of steps in passing the bean bags. Use bean bags to toss—or be creative and toss something based on the theme. Example: Scrunched up paper or large marshmallows for a winter theme. Several balloons and string needed. Each player is given two balloons to be inflated and tied around each ankle with a piece of string. Object of game is to burst the other players balloons with their feet—no hands allowed. Winner is last person with a balloon or balloons. Game can be played with or without boundaries. Players may stand or sit. Each team is given a balloon to keep in the air for as long as possible. They can only bat or tap the balloon to keep it afloat—no throwing or catching is allowed. The team with the lowest score is the winner. A contest to see who can keep a balloon in the air the longest using only their head. The person who can keep it in the air longest without using anything but their head is the winner. (This game can also be played in teams). When the leader says “1, 2, 3, GO!” The players release their balloons in the direction of the target. If you are having a THEME PARTY, use a picture from the theme as the target center. Set up a summer themed obstacle course. 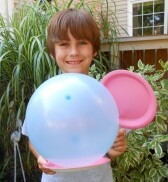 Children place a water balloon under their chins and must negotiate the obstacle course without breaking the balloon. This can also be done as a cooperative activity or group initiative. If a balloon breaks, that person must go back to the beginning, get another balloon and start again. The team must wait for the missing member to rejoin. Many water balloons in buckets or tubs, laundry basket. Participants stand in a circle and pass one balloon at a time around the circle–until many balloons at one time are going around. After a given time, the number of balloons successfully passed is tallied. Players then try to beat their score. 45. MAKE YOUR OWN BEAN BAGS FOR GAMES OUT OF PAPER NAPKINS! The Bean Bag photograph is courtesy of School in your Home. All you do is crumple up some napkins into a tight ball and then wrap another napkin around and secure in back with a rubber band. You can color the napkin with water-based markers before wrapping it or after. Experiment to see which works better. These inexpensive beanbags make for a fun activity for all ages–preschool and up! They would also make nice puppet heads! There you have it, 45 fun relay races for kids. Make sure you check out our fun fall games and activities as well.